Traditionally served with couscous but creamy mashed potatoes would also be delicious. 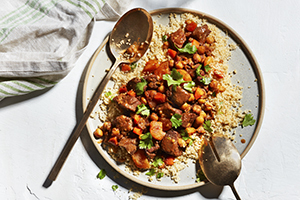 Place lamb, chickpeas and apricots in 6 quart (6 L) slow-cooker. In small bowl, combine ground coriander, cumin, paprika, salt, cayenne, cinnamon and black pepper; set aside. In large nonstick skillet, heat oil over medium heat. Add carrots and onion; cook for 5 minutes. Add ginger, garlic and spice mixture, stir about 30 seconds or until fragrant. In small bowl, whisk together broth and tomato paste; stir into vegetables. Bring to simmer. Pour into slow-cooker, stirring to combine. Cover, cook on LOW for 6 to 8 hours or until lamb is tender. Serve over couscous; top with coriander.